In August, Jacky and I together read GENESIS 1-25; PSALMS 1-18; PROVERBS 1-5 (memorizing 1:7; 2:6; 3:7; 4:23; 5:21); MATTHEW; ACTS 1-11. Feel free to share any testimony, insights, or thoughts on any of the above Scripture. Feel free to also share any Bible reading goals or plans you have, and/or to declare your Bible reading whenever you want that would help you most. Let me know if you want to commit to declaring monthly Bible reading as an accountability help and for mutual encouragement with other Bible readers here on memverse. Today I'm officially on day 29 of Prof. Grant Horner's Reading plan and I can say that I have never been this disciplined in reading Scripture in my entire life. I began the 10 chapters a day 30 days a go with a friend and we have only missed 1 single day. The plan has actually made reading the Bible the delight of my heart when before I was always inconsistent in my daily reading. Everyday its a new 10 chapters (because of the structure of the plan, you will never read the same set of 10 chapters) and I find myself looking forward to read them, usually first thing in the morning. Most of the time after finishing 10 chapters it feels only like a warm-up and I want to do another set of 10 or even 20 chapters! This is very unusual and might be attributed to reading with someone else (we alternate reading a chapter each) but I believe this plan is just as beneficial for personal reading. The best part of this plan is that you begin to see connections in Scripture almost immediately because of the nature of the plan, and Scripture begins to interpret Scripture more and more as you read in an increasingly interweiving fashion. And yet he wanted to die. for the sword to go in. to run down that the soldiers put on him. So I plead with you, when youâ€™re reading the Bible and you read texts like: â€œHe loved you and gave himself for you,â€ you wouldnâ€™t go too fast over it. Linger, linger, linger, and plead with Jesus that your eyes would be opened. By the way, my 10 chapters for today: Mark 1, Genesis 29, 1 Corinthians 13, 1 Peter 2, Job 29, Psalsm 29, Proverbs 29, Judges 5, Isaiah 29, Acts 1. I guess that there was a guy I can't even remember his name but he challenged me to read through the Torah and the Gospels once a month. I also try to read through the bible I don't know I love big picture reading just about as much as memorizing. but I would join into this accountability group. @ Victoria M. you guys are missionaries to China ! I also noticed that you are in the Journey to the Heart group. Do you know Chinese ? Well, you probably do. I just long to learn it that is all. I hope you see this comment. @Arthur--I agree with everything you just said. I, too, have been doing Prof. Horner's plan, and I am now on day 38, having only missed one day. I completely agree that it just makes you want to read more once you've finished for the day. It is an amazing thing how God's Word never gets boring, uninteresting, and especially not non-beneficial, no matter how much or how many times you read it. I also agree with the sentence you quoted from Mr. Walker--I fall into that trap as well. I just read and memorize for the sake of being praised by everyone else. How prideful of me! What an amazing thing that God would allow Himself to become one of us and not only care for us, but DIE for us. We serve an infinitely amazing God. I will also try to start thinking about what I'm reading, as you said. That is one of the things I really have trouble with. God's Word is precious enough that I could spend the rest of my life just sitting and studying it, but when I try to convince myself that I have better things to be doing, I just speed through it without thinking about it. Thank you, God, for forgiving me for that!! P.S. I like your new name, God's Bondslave! Genesis 39, Judges 15, Job 39, Psalm 39, Proverbs 8, Isaiah 39, Mark 11, Acts 11, 2 Corinthians 7, and 1 John 4. Bible reading is so, so beneficial!! I also have been using Prof. Horner's system for Bible reading and have found it very profitable. Today I read my 74th day in the system - John 7, Exodus 24, Hebrews 9, 1 Timothy 1, Job 12, Psalm 74, Proverbs 12, 1 Samuel 25, Jeremiah 8, and Acts 18. It was amazing to see how Exodus 24 and Hebrews 9 are intertwined and explain each other! No matter how many times you read the Word, there is always a new insight or a deeper understanding to be gained -- all provided by the Holy Spirit who illuminates. For those interested in going deeper without necessarily increasing quanitity in reading, I have found it highly meaningful to read through the first 9 chapters of Proverbs, a section a day (most Bible will delineate the sections for you), and writing down the topics covered in each section (i.e., wisdom vs. foolishness; parental advice to children, resisting evil influences, the divine characteristics of wisdom, etc.). Once you get to the more random proverbs of chapters 10-29, read a verse a day, and start to place the theme/topic of that verse into more specific categories, like "Wisdom," "Foolishness," "Laziness," "Wickedness," "Anxiety," "God's Sovereignty," "Correction," "Rebuke," etc. There will be overlap of some themes, so a verse may end up in 2-3 (or more) categories. Once you get to chapters 30-31, it becomes more like sections again, such as "the virtuous wife," "creatures that teach us wisdom," etc. I have found this to be a valuable endeavor, because, by the time you're through Proverbs, you've created a personal reference guide that enables you to find various themes/topics in Proverbs much more easily when a random topic or conflict arises and you need a Proverb that addresses it. For instance, when I need to show what Proverbs has to say about whether there is any value in using rebuke as a training tool in helping someone to grow in godly wisdom, I can go to my list of thematic categories from Proverbs, and find several verses addressing the topic. I have also found it very helpful in providing counsel to parents struggling with correcting their children or on matters pertaining to the depravity of the human heart or God's sovereignty in the everyday minutiae of life. The other great asset about it is that you can carry on this endeavor while engaging in daily reading, study, and/or memorization of several other chapters of Scripture; it only requires a few minutes of your time each day, but the resource it creates will be of value to you for years to come. Just a suggestion for those looking to increase their reservoir of wisdom training & instruction, while plowing through the vast treasury of the other books of the Bible. By the way what is professor Homer's system ? This is what I read yesterday Genesis 16-24 Joshua 16-24 Psalms 6, 36, 66, 96, 126, Proverbs 6 Song of Soloman 2-8 Hosea 2-10 Matthew 16-24 Acts 16-24. On day one of the system you read the first chapter of Matthew, Genesis, Romans, 1 Thessalonians, Job, Psalms, Proverbs, Joshua, Isaiah and Acts. On the second day you read the second chapter of each book and so on. Once you finish the book you go on to the next book in the list. Once you finish all the books in the list you start the list again. Following this plan, every year you will read through the Gospels four times, the Pentateuch twice, Paulâ€™s letters 4-5 times each, the Old Testament wisdom literature six times, all the Psalms at least twice, all the Proverbs as well as Acts a dozen times, and all the way through the Old Testament History and Prophetic books about 1 1/2 times. It seems like my comment saying ten chapters may seem like a lot is out of place considering your daily reading consists of 52 chapters! Wow! That is amazing. Way to be an inspiration to all of us. Do you follow a specific reading plan? It seems like you have some sort of variation that is very similar to the Horner plan (reading from various sections). Either way keep it up! Arthur Roshkovski - I'm curious: I see you have your church set to GFA.org. Do you work with Gospel for Asia? Okay, I have heard a lot about this Bible reading plan where you read 10 chapters a day. Where do I find the link to show what you read each day? I see a link that somone put up a few comments ahead of me, but I don't quite understand it. I don't think I'll start right now, since I'm doing the Bible Bee, but I might consider it, for when I'm done. Thanks. EDIT: Thanks for the link, Alex! Bethany - Arthur posted a link a few comments above for the bookmarks (that link to a JPG image on "nwbingham.com"). Here is the PDF that explains the plan: http://www.willowbendchurch.org/docs/ReadingPlan_HornerSystem1.pdf. If you read that, you should understand it. There is a page with the bookmarks in the PDF, though if you like the bookmarks that Arthur posted better you can certainly use either. @ Arthur I developed my own bible reading kind of. Well first my Grandfather got me reading the Bible at a young age about six and I would read the Psalms and Proverbs for the day so if it was the first I would read Psalm 1, 31, 61, 91, 121, and Proverbs 1 and then so on. Then when I was twelve I started reading the Torah through and the Gospels in one month. Then after Bible Bee this year I decided to add two readings for the Prophets in the old testemant and one for Joshua - Job and also the Epistles. But I have to admit I don't do this every day. As I do Greek word studies through Romans and 1 Peter and work here on Memverse memorizing I probably only do it once every two days. Rachel, sounds like a good grandfather to have who loves to wisely MATTHEW 6:19-21 invest his money in the future and in his and other's eternal retirement, rather than foolishly over-invest in a few years of more comfortable temporal pre-retirement here on earth. Alex - I don't work for Gospel for Asia but I use it for my "church" to spread the word and support the ministry and its work in the crucial 10/40 window. Finished reading: Mark 3, Genesis 31, 1 Corinthians 15, 1 Peter 4, Job 31, Psalm 31, Proverbs 31, Judges 7, Isaiah 31, Acts 3. Arthur - That's a good idea. I like Matthew 24:14 and verses like it (Revelation 5:9-10) that guarantee there will be people from every tribe and language and people and nation who will serve and worship God! Someone shared that video message from K. P. with me a few months ago - very good message. Thanks. 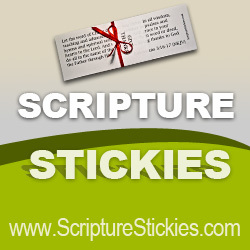 @Rachel Crosswhite--I'm glad to hear you're doing this Bible-reading system. And I'm also glad you have the same kind of enthusiasm about it that I had (and do). It definitely is a great and fun way to read the Bible. P.S. Christian and I will be gone this afternoon at a conference, so we won't be able to make it to the quiz. Have a great time, everyone! I'm a student of languages, so I combine learning those languages with reading the Bible in the language I am learning, by means of a parallel translation. I'm currently reading the New Testament in Arabic. This has been a project over the last 4 years, but I'm picking up speed and only have Mark 2-16, Romans, Galatians, Colossians, 2 Timothy, Philemon and Jude left on the menu. It's been delightful to read the Word of God in a new language you are learning! God speaks in fresh ways and of course revelatory insight comes with it. Start with your favorite books, and you can glean most of the meaning of the words you don't know yet from your knowledge of that passage in any other language you master. I am working on my Mandarin to get to the mediocre level that I can start reading the New Testament in Mandarin maybe by the start of 2013? That will be great! 2012 will be used for reading through some Old Testament books in Arabic then: Proverbs, Genesis, Isaiah and Daniel to start with. It's fun to formulate realistic targets for future reading! In the mean time, keep up your efforts to memorize the life-changing Word of God and yield to the Holy Spirit! @BBJ11- Yay! I'm so happy for you! I've been praying and glad that you're getting better... not that I thought that you wouldn't get better, but it's just nice to know... :? I am doing 5 chapters a day, but I am trying to get where I can read 10 chapters a day monday-friday and 5 chapters on saterday and 5 on sunday. I have missed days, but I think I am getting better. I am so glad to be part of this accountability group!!!!! PS one reason I am finding it easy to do the 5 or 10 chapters a day thing is that I hardly ever read books like Job or Acts and I am finding it very interesting to read. [In fact, I look forward to reading the chapter from Job more than any others]! @Constance Keating - Thank you so much for praying! I know what you mean. :) I'm home now! We just got home about 20 minutes ago!! @Mr. Goedbleod - wow! How many languages do you know? Can you speak those fluently? That's so cool! My dad is from the Philippines. Do you know any of the Philippine languages? Hey guys! Here's my caption for my profile picture; why don't you guys add one for my profile picture too! My siblings and me read 1 or 2 chapters a day (depending on age), at least. Today's the day... who here has been directly or indirectly affected by 9/11 ten years ago? I suspect everyone has in some way. I was only three when it happened, and I don't think we were near the TV or Internet around that time, so I don't remember anything much about it. Let's pray for the countless families who lost someone that tragic day. And just as important, let's pray for even those who set the thing up, that they will come to repentance and faith in Jesus, the Savior. Today is a sad day for America; but we, unlike most of America, know that the plane crashes had a purpose. God did not slip up that day. He has a plan for everything. Sorry, I just realized I commented this on the wrong post. do you have to study 2 Peter on your own, or do you have a study like for 1 Peter? No, RC, this time we have to study it on our own. We were mailed a basic weekly outline of what chapters to do when, but other than that, nothing. We have to figure out key words, look them up in a Greek Lexicon, and determine good cross-references (and I personally read a verse-by-verse commentary from John Gill just to help me better understand everything). @Rachel Crosswhite - We have no Sword Study. That makes the study a bit more difficult, especially with the cross-references and all. But I think that the National Qualifiers should know by now how they ought to study a book of the Bible in-depth. :) I hope that there will not be too many questions about those cross-references on the test. I hope that there will not be too many questions about those cross-references on the test. @Rachel - are you going to nationals? @Rachel - were you a senior this year? so what is happening? Are we going to declare Bible readings? We welcome any insights you have on these passages and others sharing their Scripture reading. At this point we don't have an official accountability group but are open to one developing if there is an interest. May God bless all of us as we take time to treasure, meditate on, and obey His Word. Wondering how those who started Prof. Horner's plan awhile back are doing? I enjoyed it for awhile but am still trying to decide if losing the direct context in favor of gaining general context (reading so many different parts at once) is for sure worth it. any comments on how it's going for you? @Sheri--Yes, I'm having some of the same problems with it. I don't think I'll be quitting any time soon, but it is a little hard to retain what I read. I am, unfortunately, not doing it nearly as often as I should be, and I think I will be picking up the pace now. It takes up a lot of my time, but it's definitely worth it! And one more thing--Prof. Horner said that after doing it for a few years, and reading over the Bible a few times, it will be much easier to read the ten chapters each day, and you will be able to retain much more after getting the basic idea of it. In October, Jacky and I read together GENESIS 48 - LEVITICUS 2; PSALM 34 - 56; PROVERBS 11 - 21 (memorizing 11:24-25; 12:11; 13:24; 14:27; 15:13 and 30; 16:7; 17:5; 18:10; 19:21; 20:13; 21:31); LUKE; ACTS 24 - 1 CORINTHIANS 7. We praise God for the power and sweetness of His Word and for the time and grace for being able to once again complete a gospel in a month and for having our best month of reading thus far. However we will have to pick up the pace a little with a few "extra Scripture reading" days if we are going to meet our next challenging goals of finishing both PSALMS and ACTS - REVELATION by the end of January, 2012. Although behind pace, we are not too worried about our goal of finishing PROVERBS by the end of November, 2011. In November, we will also face the challenge of being apart for at least 5 days and possibly as much as 20 days depending on if Jacky gets granted a visa to join me in the USA or not. Are you in the USA now? I just finished reading through Ecclesiastes. I praise God that we still met our November target goals for PROVERBS and JOHN even though we fell further behind in reading the OT, NT and PSALMS. We continue to trust God to lead us both in times to read together and in making the times meaningful and rewarding in our lives. In November we read together (some of it over the phone or by skype) LEVITICUS 3 - 11; PSALMS 57 - 65; PROVERBS 22-31 (memorizing 22:24-35; 23:6-7; 24:26; 25:28; 26:20; 27:4; 28:13; 29:18; 30:7-9; 31:8); JOHN; 1 CORINTHIANS 8 - 16. Tomorrow I fly back to the Philippines and look forward to reading a lot more with Jacky as well as beginning our Memorizing Elijah project together on Monday, Dec 12th. Anybody else reading through portions of the Bible together as a family or couple? In December, Jacky and I together read LEVITICUS 12 -21; PSALM 66 - 76; PROVERBS 1-2; MATTHEW; 2 CORINTHIANS 1-6. We are looking forward to some extra reading sessions in trying to meet our original goal of finishing both PSALMS and the NT by the end of January (our 6th month). We have decided to tweak and significantly shorten our original plan now planning to read the OT once every two years rather than once a year. @To All - As this new year begins, a few other Bible Bee contestants and myself are doing a Bible reading plan where you read through the Bible in 90 days. On average, you read about 13-15 chapters a day, depending on how long/short the chapters are. I was wondering if there were any Memverse users that would like to join us on this reading plan? We'd welcome anyone who would like to join with us in doing this! @Bethany- That sounds really neat! You can count me in. Are you starting in Genesis and going in order? @ Bethany Pentimone I am somewhat intersted in doing this. It would be done before the Bible Bee started, which I think would be a good thing. Is that why you are using a 90 day plan? @MilesChristiSum - I guess you could say that was part of the reason.... more though, because I didn't do much reading of the Bible minus 1 and 2 Peter because of the Bible Bee. I will try and join you guys as you read through the Bible in 90 days. Last year I read through the whole bible (almost, I only had Hebrews and Revalation left), and I know while doing the sword study for the Bible Bee, I wasn't doing any regular Bible reading. When I did end up getting to it though I was reading 3-4 daliy sections to catch up. May I ask what age division you were in, in the Bible Bee? @Bethany Pentimone I was in the senior division last year. Thanks for the link. @ Bethany Pentimone I am somewhat intersted in doing this. It would be done before the Bible Bee started, which I think would be a good thing. Last year I know while doing the sword study, for the Bible Bee, I wasn't doing any regular Bible reading. I was in the junior division last year. Thanks for the link. Just wondering...but do you, RedeemedByGod, know MilesChristiSum? @ChosenByHim (Bethany M), RedeemedByGod, MilesChristiSum -- How is the Bible reading going? Not too bad! I'm behind right now (I just started Ezra) but I'm catching up again. Bethanys, great to see you are enjoying and keeping up in reading. In January and the first few days of February, Jacky and I together read Leviticus 22 - 27; Numbers 1 - 5; Psalm 77 - 119; Proverbs 3 - 8; 2 Corinthians 7 - 13; Galatians - Philemon; Hebrews 1 - 2. We missed our two goals of finishing both Psalms and Acts - Revelation in 6 months (finishing Jan 31st) However, we are close enough that we plan to finish both and then begin again to, Lord willing, finish our 2nd time through back on schedule on July 31st. We praise God for the richness of His Word and the joy and benefit in our marriage to reading it together. @ Alex, thanks for your reminder to focus on the gospels. Reading 1 gospel each month helps us keep Jesus' life and teaching in our minds, thoughts and discussion. @Mr. Walker - God's Word is rich indeed! I am amazed that while I read through the Bible again, I am finding so many things that I had never noticed before! I am starting in the Gospels (2 chapters a day) and it's been wonderful! @Bethany M. -- How is the Bible reading going? Just one more month! @Bethany - Pretty good! Where are we supposed to be, according to the schedule? Bethany P, glad to see your testimony of enjoying reading Scripture and your chance to read the Gospels. Praise God. In February Jacky and I together read Numbers 6-8, Psalm 120 - 138, Proverbs 9; Luke 1-10; Hebrews 3-10. We had many distractions and were not consistent with our reading. However, we praise God for each reading session and pray we can get back to a more regular schedule. Now we are clearly behind. 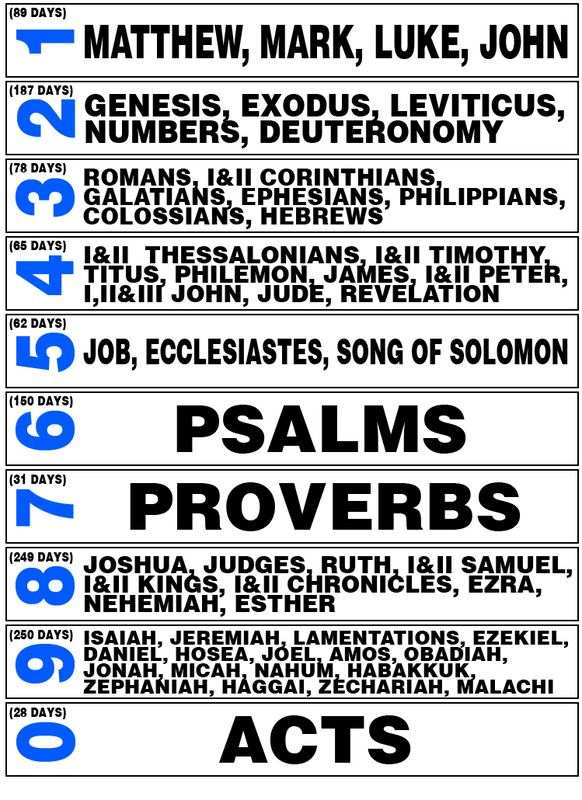 We were scheduled to finish Psalms on Jan 31st, Luke on Feb 29th, and Revelation on Jan 31st. We don't want to be legalistic or to have reading ever be a burden or chore or speed activity that has no meaning. March could be our moment of truth. We believe our schedule is reasonable and trust that we will be able to catch up and get back on schedule while still having powerful reading meeting with God sessions. If instead we get further behind in March we may have to reevaluate our schedule. PS In looking over our last report, I noticed that we forgot to mention that we read MARK in January. @ Bethany Pentimone - sorry for not answering you in Feb when you asked how we were doing I was behind and still am (maybe 5.5 weeks ) but I'm still reading and hope to be done sometime soon. How did everybody do? My mom finished on the 90th day! I'm still going - I've made it my new goal to finish by the time Bible Bee starts. Like MilesChristiSum said, I'm reading a lot more that I would have ordinarily. Before, I was doing good to get one or two chapters in! Jacky and I are not only behind in our scheduled Bible reading. Now we are behind in reporting. However, God is good and His Word is good. In March we read together NUMBERS 9 - 12; PSALMS 139 - 143; PROVERBS 10 - 12; LUKE 11 - JOHN 4; and HEBREWS 11 - 1 JOHN 2. We have been having a very hard time recently prioritizing joint Bible reading time. We don't want to be legalistic but do want to be more disciplined and passionate about reading His Word together. Pray for us. We are open to changing our current schedule of GEN - JOB; ECC - MAL once every 2 years; PSALMS once every 6 months; PROVERBS once every 4 months; a Gospel each month; and ACTS - REV every 6 months. However, we still believe this is the right goal for us and are praying to get back on tract and even to finish our first year (at the end of July) on schedule while still ministering here at STT Setia in Indonesia www.memverse.com/assets/SETIA.pdf and while expecting a, Lord willing, Bible loving Junior Walker on July 4th. I can't wait for him to one day join us with our Bible reading and treasuring God's Word! In April Jacky and I read together NUMBERS 13 - 19; PSALM 144-150; 1 - 3; PROVERBS 13 - 18; JOHN 5 - 21; MATTHEW 1 - 4; 1 JOHN 3 - REVELATION 22 and ACTS 1 - 4. We are loving the Scripture reading while still finding the discipline of daily Bible reading difficult. We are also prioritizing daily joint focused prayer above the Scripture reading at this time, but hope the Bible reading can increase while keeping a strong priority on prayer. We praise God as we completed our first time reading through PSALMS and through the New Testament together!! In March I started yet another reading the Bible program, I have lost a month in getting going with finding consistent time to read. However, I am excited about the 2 months worth that I have been able to read and hope, Lord willing, to be able to keep this going. I am reading PSALMS and PROVERBS each month; reading through the Gospels and the rest of the New Testament simultaneously at the pace of once every two months as well as reading through non PSALMS/PROVERBS Old Testament each day at the pace of around4- 5 chapters a day which comes to once through every 6 months . I know it is not the most ambitious program in the world, but plenty challenging for me as a father of 3 young kids and full time ministry work and dreams. I also ask for your prayers as I absolutely love the fruit of consistent Bible reading and regret the many months this has not been a regular discipline of mine.